This serial silencer used to reduce the dynamic noise for the pneumatic components or device exhause. ompat design allows easy installation in a narrow space ,Silencers, Sintered Silencers, Sintered Bronze Silencers.Pneumatic sinter silencers suppress the exhaust noise of air release. 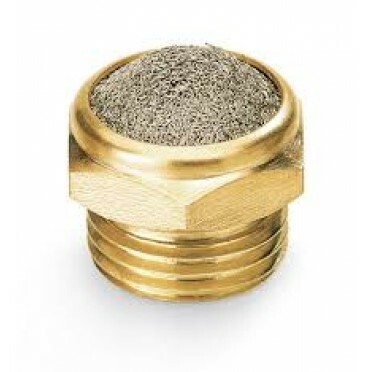 Available materials include sintered bronze, plastic and stainless steel. NPT – National (American) Pipe Tapered Thread, BSPT (R) – British Standard Pipe Tapered Thread, BSPP (G) – British Standard Pipe Parallel Thread. Size Available : M5 x 0.8, 1/8", 1/4", 3/8", 1/2", 3/4", 1"